Being refined can be a desirable quality. It reflects a process in which the best possible features have been distilled and are on display. With this refining process there are traits which are curbed, and sometimes lost forever. While these lost characteristics are rarely missed in today’s existence of consistency everywhere, the absence of variability lends a consistent repetitiveness to the environment which removes the potential for some pleasant surprises. Fortunately Wakulla County has many natural surprises for anyone adventurous enough to seek out and try some of the native fruit varieties. 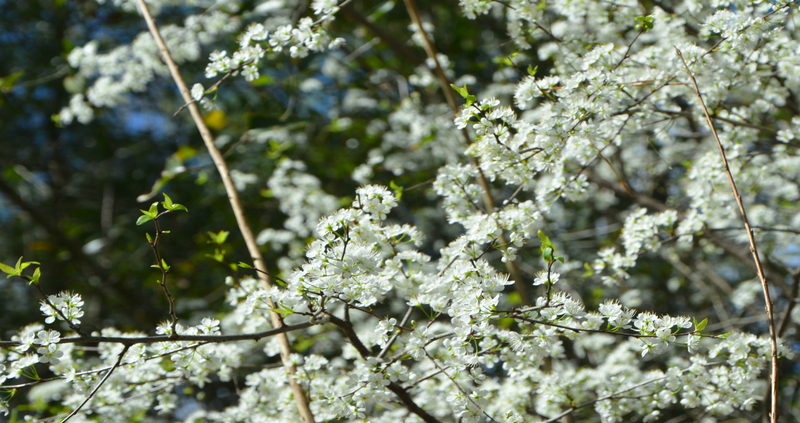 Wild plums are currently blooming and sparkleberry will be in the coming weeks. Both species are native to the area and once provided earlier residents with the basis for many pints of homemade jelly and other family-based recipe favorites. Self-reliance and limited resources dictated the use of these seasonally available treats. During the summer children, when not working in the fields or on the farm, would search the forest and pasture edges for these natural taste delights. It was always more fun to seek out a source of sweet fruit than to stick with the required chores. Sparkleberries have had some success transitioning to contemporary landscapes. The erect structure of the plant and the showy white blooms make it an attractive specimen which contrasts well to other foliage. Additionally it has a low allergenic rating, an important feature for those who suffer from hay fever and are seeking an early blooming addition. The March blooming period is also a favorite of honeybees. The Chickasaw Plum, Cherokee plum, Florida sand plum, or hog plum, are some of the names used to identify the native plum species. Like the sparkleberry, it blooms early and is an important source of nectar and pollen for bees, wasp and other insects. It is an excellent plant to attract a variety of smaller butterflies to a landscape, and specifically hairstreak butterflies. It is also a source of nutrition for a variety of wildlife and bird. Unfortunately, it serves as a host to some pest which encourages the removal of this native from a variety of situations. Plum curculio, a destructive insect, is the most serious peach pest in north Florida and flourishes where wild plums are common. Wild plums may also harbor Xylella fastidiosa, the causal agent of phony peach disease in peaches and plum leaf scald in non-native plums. This bacterium is found in Florida’s wild plum trees, but causes no observable damage to the native plums. The recommendation for commercial production of peaches or plums is to remove any native plums within 400 yards of the orchard. The suggestion for hobby orchards or dooryard peach or plum trees is to follow the same protocol, if possible. This disease can also be transmitted from wild plums to the peach trees by leafhoppers. It results in tree dwarfing, distorted small fruit, and poor fruit production. The leafhoppers are strong flyers and impossible to control with insecticides. The only efficient way to control the disease is to remove the native wild plums. So for those in commercial fruit production and home orchards, it comes down to one question. Is it best to be refined, or to go wild and take your chances? To learn more about native fruit in Wakulla County, visit the UF/IFAS Wakulla County website at http://wakulla.ifas.ufl.edu or call 850-926-3931.